The CARE for AIDS center in the Nyamasaria community launched in June of 2011. Nyamasaria is a slum community in Kisumu, and most community members in the area are living in extreme poverty. 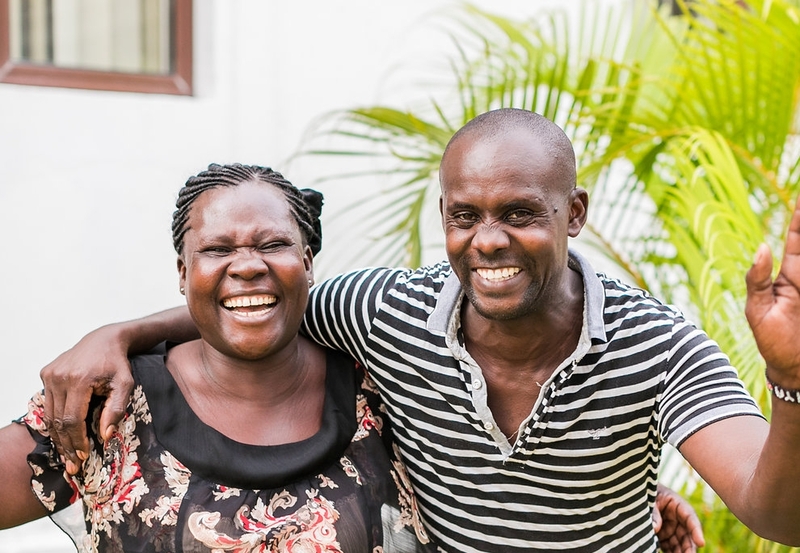 The CARE for AIDS center in Nyamasaria operates in partnership with St. Monica Anglican Church of Kenya under the leadership of Pastor Peter Odhiammbo Onduu and center counselors Dennis Omondi and Ruth Akoth (pictured below). The current class of 75 HIV+ clients is on track to graduate in July 2018. This class of clients represents 198 dependent children, and two clients in the current class have already made first-time faith decisions. Ruth joined the CARE for AIDS team in 2011 and has faithfully served over 400 clients in the program. She and her seven children live in the Nyamasaria community and are very involved in their local church. Dennis joined the CARE for AIDS team in 2011 and feels called to serve the HIV+ population in Kisumu. Beatrice learned about her HIV status just 4 short months ago. She has suspected for a while that her husband might be HIV positive. He would often get sick, but would only get treated in private hospitals where he would opt not to be tested for HIV. He is gone most of the time and only comes home occasionally. Beatrice suspects he has another wife or concubine, but he still supports Beatrice and their 5 children. When she’s tried to talk with her husband about being tested for HIV, he ignores her and won’t open up about it, so she avoids the subject. In January, when both Beatrice and her 2-year-old child were sick, she went to the clinic and had them both tested. Both she and her son, Emmanuel, are HIV positive. In the same month, Beatrice was recruited to join the CARE for AIDS program at Nyamasaria. After only being in the program for 3 months now, Beatrice says she already feels stronger. She’s realized that she is not alone in this journey. She has made friends in the program and during group therapy at the center they share about their challenges and are able to encourage one another from their personal experiences. Every time she leaves group therapy she feels more hopeful about her future. “Many of the others in the program are very healthy and you would never guess their status.” After seeing other clients in the program who are HIV positive yet look healthy, Beatrice was encouraged by the face that there are probably many more people in her life and community who are living with HIV even though she doesn’t know it. The stories and testimonies of other people who are in the program with her give Beatrice motivation to do her best to stay healthy. Currently, Beatrice goes door to door to sell African fabric called kitenge to make money for her family. She’s excited about learning some new skills through the CARE for AIDS seminars in hopes that she can start selling new items and grow her business so that she can sustain and provide for her kids. She has already learned how to make soap and has started practicing making it at home. Beatrice’s determination to do well comes from her youngest son, Emmanuel. She wants to live a long life so she can raise him and encourage him in the same ways that she is being encouraged. She also hopes that God will give her opportunities to use what she is going through now to testify to others who meet similar challenges in the future.